Now in its third year, the YWCA Canberra Clubhouse has evolved significantly, and continues to make a difference to the lives of so many young people. We now have 200 members, who have had access to cutting edge technology, industry mentors and environment that fosters their creativity and independent learning almost every week of the year. In this report, you can meet our Clubhouse members and Ambassadors, hear more about other big projects and milestones that we’ve achieved throughout the year, and learn more about our objectives and outcomes. These initiatives are outlined in the 2016 Clubhouse Impact Report, where you can also meet our Clubhouse members, hear from our Clubhouse Ambassadors and learn more about our objectives and outcomes. YWCA Canberra’s Clubhouse is an innovative, creative, out-of-school learning space where young people from underserved communities can work with adult mentors to develop new skills, explore their own ideas, and build confidence in themselves through the use of technology. Founded in Boston in 1993, the Clubhouse Network now extends across the world, providing 25,000 youth per year access to resources, skills and experience to help them succeed in their careers, contribute to their communities and lead outstanding lives. The YWCA Canberra Clubhouse is located in Richardson, in the Tuggeranong region, and is a space where young people can drop by to engage with mentors, embark on new projects, and learn in a safe, friendly and open environment. Download the YWCA Clubhouse One-year Impact Report to find out more about the great outcomes we’ve seen through the program so far! You can also celebrate with us by downloading this special desktop image. What can Clubhouse members learn? The Clubhouse learning approach is designed to empower youth from all backgrounds to become more capable, creative, and confident learners. The Clubhouse draws from a vast range of fields, from graphic design to programming, robotics to cinematography, engineering to animation and much more. Members can drive their own projects according to their interests and ideas, and the Clubhouse Coordinator provides support and assistance. Clubhouse mentors also engage with members by sharing their experience and knowledge. 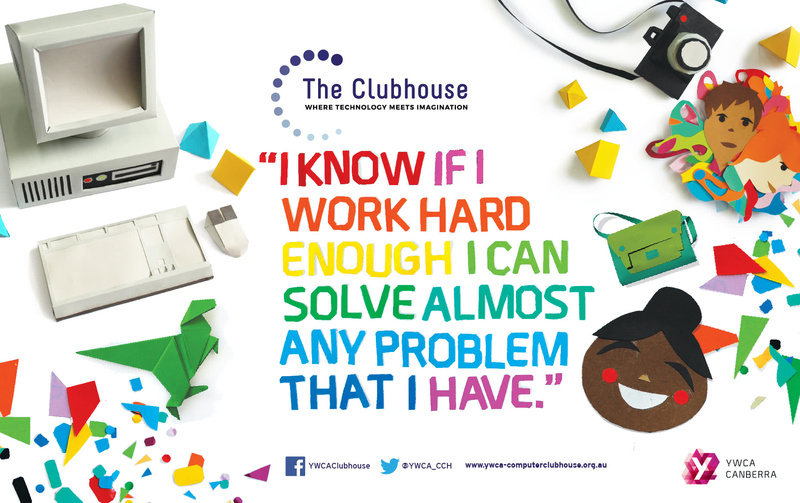 The Clubhouse really shows that young people learn best when they can work on projects that they are passionate about and actively engage in designing, creating, and inventing – not just passively receiving information. The Clubhouse is open anyone aged 10–18 in the Tuggeranong area. No prior computer skills are necessary! To find out more about becoming a Clubhouse partner contact Helen Machalias, Director, Communication, Advocacy and Fundraising on 02 6175 9900 or helen.machalias@ywca-canberra.org.au. You can view our current partners here.